ARE BLUE BANDED BEES BUILDING IN YOUR HOUSE? We sometimes receive enquiries about native bees that have dug little nest burrows in soft mortar or mudbricks in houses. The native bee which makes these nests is usually the Blue Banded Bee (Amegilla). A male Blue Banded Bee sleeping at night on a twig. 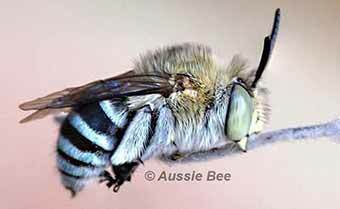 Blue Banded Bees are amongst Australia's most beautiful native bees. They have a furry red-brown thorax (mid segment) and iridescent blue stripes on a glossy black abdomen (hind segment). They are one of our solitary native bee species and are found in every state of Australia except Tasmania. They are good pollinators in the garden and can pollinate crops such as tomatoes, eggplants and kiwifruit as well as native plants such as Hibbertia, Senna and Solanum. Blue Banded Bees are not at all aggressive but they can give a mild sting if you grab them or step on them. Adult Blue Banded Bees usually fly only in warm months of the year (October till April) and all the adults die as the cold weather begins. But just because no Blue Banded Bees can be seen flying during the cold months does not mean that there are no bees present. During the cold months there are young, immature Blue Banded Bees dormant inside the nest and they will stay there until spring arrives. In the wild, Blue Banded Bees nest in soft sandstone cliffs. However, in towns and cities Blue Banded Bees may nest enthusiastically in mudbrick walls, the soft mortar of old brick buildings, or soft earthen banks underneath houses. Using mortar or mudbricks with a high concrete content usually discourages them. Understandably, home owners sometimes wish the bees were not nesting in their houses, however, many people kindly accept their uninvited guests once they realise how beautiful and special these bees are! More Information on Blue Banded Bees.